The Chief Minister of West Bengal, Mamata Banerjee, along with her party members have staged 'dharna' (Agitation) in Metro Channel area of Kolkata since Sunday night, protesting against the Narendra Modi led government. This has gradually led to a tremendous Political War in the country. 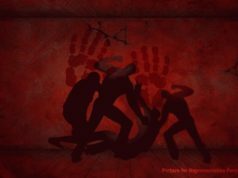 The nation is witnessing a massive showdown in West Bengal’s capital city, Kolkata, since Sunday evening. The Chief Minister of West Bengal, Mamata Banerjee, along with her party members have staged ‘dharna‘ (Agitation) in Metro Channel area of Kolkata since Sunday night, protesting against the Narendra Modi led government. This has gradually led to a tremendous Political War in the country. Ahead of the general election 2019, it is a high voltage political drama where all the prominent leaders and supporters from all the major political parties are divided into two. 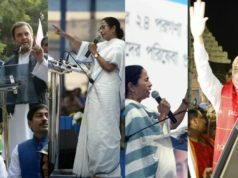 Where one side could be seen the political leaders and supporters of Prime Minister Narendra Modi-led central government, whereas the other side is full with almost all leaders and supporters from almost all opposition parties, led by CM Mamata Banerjee. Moreover, the roar of the protest could also be heard in both the houses due to which the respective chairpersons had to adjourn the houses for some time. This all began, when a team of 40 Central Bureau of Investigation (CBI) officers tried to enter Kolkata Police Commissioner Rajeev Kumar’s house at Loudon Street on Sunday evening to question him in connection with Rose Valley and Saradha Chit fund cases. Rajeev Kumar is accused of destroying the electronic evidences or not handing over the evidences related to the respective scams to the CBI. Mamata Banerjee soon visited the cop’s house as soon as the news of CBI team’s arrival at Kumar’s residence broke on TV. Following which, 5 CBI officials were arrested by the police accusing them of visiting the commissioner’s house without having a search warrant against him. The surprise visit by the team of CBI to Rajeev Kumar’s residence sparked the face-off between Mamata Banerjee and CBI. The Chief Minister accused the Modi led government of imposing a ‘constitutional coup’ in West Bengal. Mamata Banerjee also accused the centre of wanting to impose President’s rule in all the states where the opposition is in power. “I can assure.. I am ready to die but I am not ready to bow down before the Modi government and we won’t allow the imposition of Emergency..please save India, save Democracy, save the Constituion”, she said while addressing the media persons available before her. The Chief Minister also said, “this is a Satyagraha and I’ll continue till the country is saved”. In the meanwhile, Home Minister, Rajnath Singh, had called the West Bengal Governor, Keshari Nath Tripathi, to apprise the facts of the situation. The CBI, on Monday, moved to the Supreme Court through Solicitor General (SG), Tushar Mehta, seeking directions to the West Bengal government to cooperate with the investigation in the chit fund cases, and has sought Rajeev Kumar’s availability. SG has also filed a Contempt of Court petition against the West Bengal government. A bench comprising Chief Justice of India (CJI), Justice Rajan Gogoi, and Justice Sanjeev Khanna have asked CBI to place all the evidence before it by the means of an affidavit. 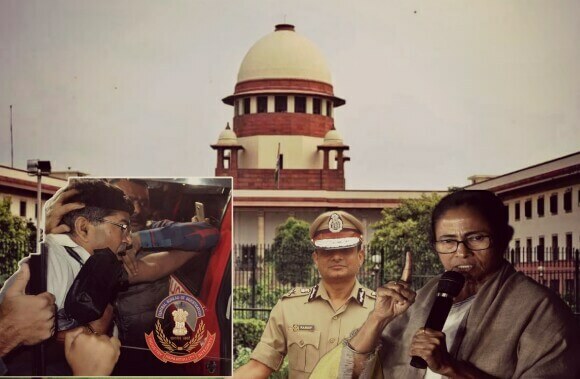 The CJI said that if the Kolkata Police Commissioner is even remotely thinking to destroy the evidences, he will come down heavily on him that he will regret. Meanwhile, the West Bengal government filed a petition in the Calcutta High Court against the CBI’s attempt to question the Commissioner at his residence without having a search warrant. The HC, however, refused to hear the petition immediately and listed it for Tuesday, February 5, at 10:30 am. 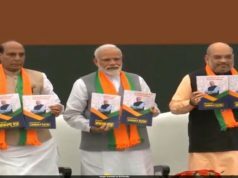 Ever since the Dharna of the Chief Minister has begun, there came the flood of support from almost all the opposition parties who wanted another big sling shot at PM Modi. From Congress Chief, Rahul Gandhi, to People’s Democratic Party (PDP) Chief, Mehbooba Mufti, all the leaders seemed expressing their solidarity with ‘Didi’. 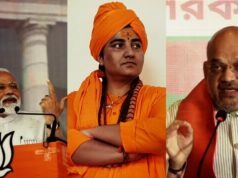 All the Modi rivals joined hands to take the case to Twitter where everyone made a scathing attack on Modi-led central government and expressed their empathy towards Mamata Banerjee. Here are some tweets from the prominent leaders who stood with Mamata Banerjee in this whole political drama. Aam Aadmi Party (AAP) Chief, Arvind Kejriwal, tweeted, “Spoke to Mamta didi and expressed solidarity. Modi-Shah duo’s action is completely bizarre and anti-democracy”. Samajwadi Party (SP) Leader and former Uttar Pradesh Chief Minister, Akhilesh Yadav, tweeted, “The BJP wants to stay in power by hook or by crook. They are so scared of losing that CBI is being used as election agents. This is undemocratic and against spirit of the constitution. We demand due process be followed so that CBI is not used as a tool of political interference”. He has also posted a cartoon on twitter explaining the prevailing scenario of the country. Rashtriya Janata Dal (RJD) leader and former Deputy Chief Minister of Bihar, Tejashwi Yadav, tweeted, “Spoke to respected @MamataOfficial ji. Extended RJD’s support, BJP has not only venomous & nefarious agenda against opposition leaders but Indian Administrative Service & Police Officers. Might visit Kolkata tomorrow”. While all these leaders tweeted against BJP and PM Narendra Modi, the BJP leaders were also seen at the front foot to give a befitting reply to everyone. Union Minister, Prakash Javdekar, addressed a press conference in Kolkata. 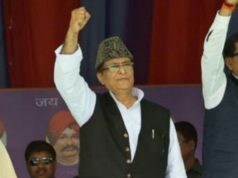 “Mahagathbandhan is divided by region & united by corruption”, he said. However, Mamata Banerjee announced to continue her dharna till February 8. “I’ll continue my dharna till February 8 because Madhyamik examination will start after that”, she said while addressing a Police function.